I bought this because I had a good experience with Cover Girl Cream Foundation. 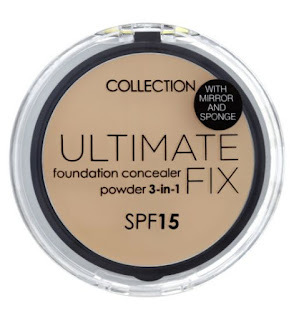 In search for an affordable version I bought Ultimate Fix Compact Foundation. The lightest shade is ivory and I chose it because I am acidic and foundation oxidizes on me if its dark. This will mostly be text, as this is a draft way back. This is ready for sharing, but not published. The pictures meant for this post was stolen along with my old mobile phone last year. Cream foundation that is supposed to act as a 3-in 1 product. It's foundation, concealer and powder in one. Lightweight solid to liquid formulation which provides the coverage of a liquid foundation with a powder finish. Creates the perfect base in one easy application. SPF15. Round plastic see through packaging wherein you can see the foundation inside. It also comes with a mirror and sponge. I actually broke my compact when it fell off once from my bag, it should be handled with care. Experience british invasion by Collection! This product from UK and it has been with me for a while. I apply this using the provided sponge. The finish is matte but dewy, its a little sticky so I need to set it with loose powder. It feels heavy given that its cream foundation so I didn't dare to use additional products underneath (no sunblock err~). Ultimate Fix Compact is indeed a multi-purpose product. I must say the coverage is awesome, its concealer and foundation in one and with one layer my dark spots are gone. It borders medium to heavy coverage, it depends on how you apply it. It doesn't highlight my pores but it doesn't cover it either. After commute though it surely made me oily. Yes there is a very thin line between dewiness and oiliness. Its P250 for the 10 grams compact. I got mine from Landmark Trinoma. As long as I love cream foundations I won't give up on them. Right now it was a let down that Ultimate Fix Compact Foundation didn't work on me, I really don't like foundations that oxidizes on me. I might just repurchase Covergirl instead.